KIT # 83113~~Dated 1994. Kit will include stamped felts, cotton floss, Persian wool yarn, gold thread, sequins and beads, needles and instructions with directions for personalization. 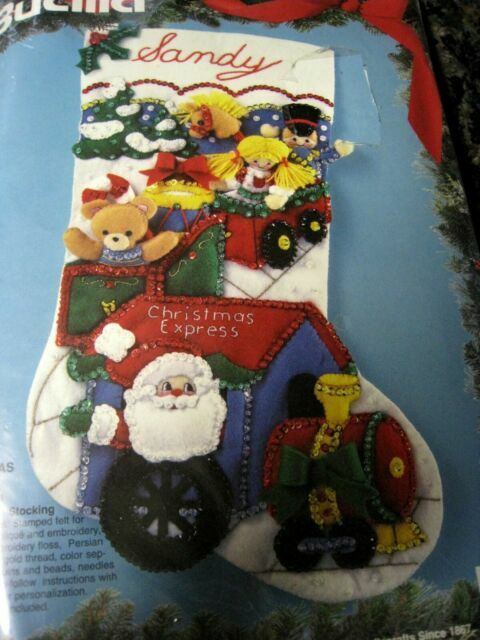 item 2 Bucilla SANTA "CHRISTMAS EXPRESS" Train Felt Stocking Kit OOP RARE Sterilized18" -Bucilla SANTA "CHRISTMAS EXPRESS" Train Felt Stocking Kit OOP RARE Sterilized18"
Kits are very easy to do, all you need is time. BUCILLA #86059 SNOWFLAKE SNOWMAN 18" FELT APPLIQUE STOCKING KIT New!